Lafayette County, Missouri; c.1929. From Fiegenbaum-Gerber family; all rights reserved. Front row, left to right: Ruby Elizabeth Begemann, Edna Anna Clara Begemann, Emmaline Augusta Begemann and Irene Henrietta Wilhelmina Begemann (kneeling). 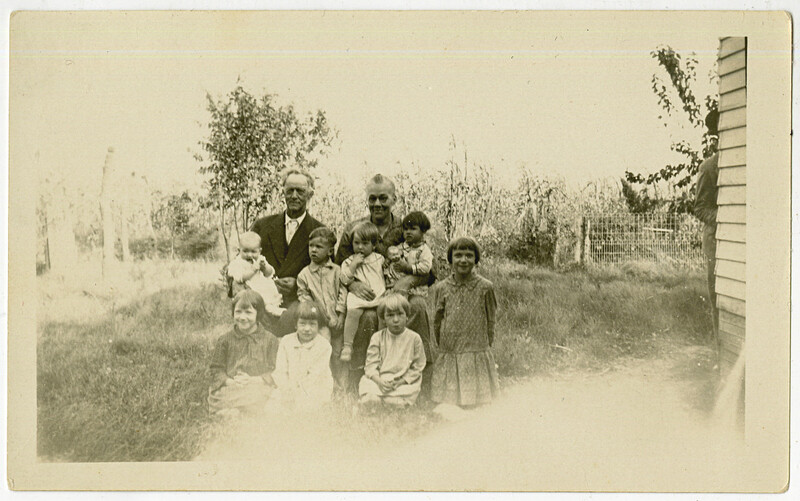 Back row, left to right: Grandpa Wilhelm Friedrich Fiegenbaum, holding August William Begemann; J. W. Fiegenbaum, standing; Grandma Henriette Fiegenbaum, holding Lydia Katherine Begemann and Dorothy Lorraine Fiegenbaum (with her doll). 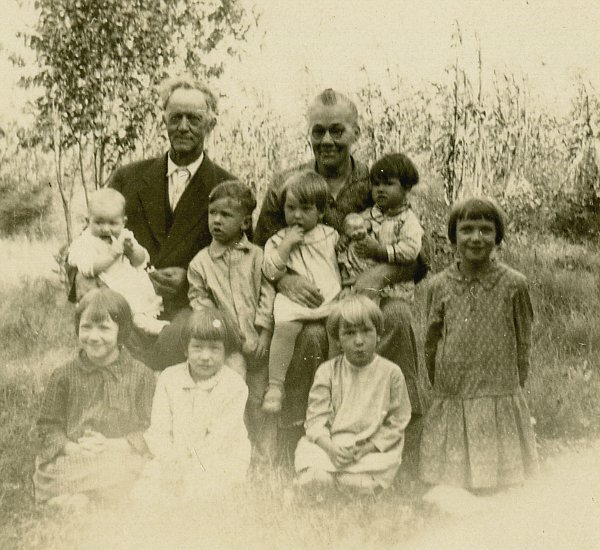 This is a detail from a photo showing Wilhelm Friedrich Fiegenbaum (1862-1929) and Henriette Caroline Ameilia (Starkebaum) Fiegenbaum (1873-1960) and their grandchildren. J. W. and Dorothy Lorraine are the children of John Henry and Katherine Margarete (Maun) Fiegenbaum. The Begemanns are the children of August Henry and Emma Florentine (Fiegenbaum) Begemann. The youngest child in the photo, August William Begemann, was born 23 February 1928, which would suggest that the photo was probably made in 1929. It is possible that this photo was taken and processed by John Henry Fiegenbaum. J. W. Fiegenbaum has identified the location as the "missle farm." During the Cold War, the U.S. government built an underground anti-ballistic missile site on the farm of the Edwin Friedrich and Lucille Marie Caroline (Rinne) Fiegenbaum family, located just north of Interstate 70 at Exit 45. It was an area of Lafayette County known as Fortyville The farm had previously been the home of Wilhelm Friedrich and Henriette Caroline Ameilia (Starkebaum) Fiegenbaum family. Lafayette County, Missouri; c.1935-1936. From Fiegenbaum-Gerber family; all rights reserved. 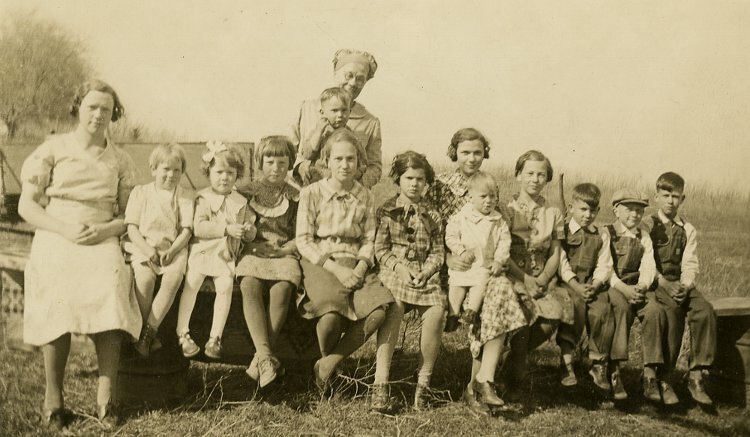 From left to right: Ruby Elizabeth Begemann; Clara Marie Begemann; Carolyn Clara Fiegenbaum (with the bow in her hair); Lydia Katherine Begemann; "Grandmother" Henriette A. C. (Starkebaum) Fiegenbaum, holding Martin Franklin Begemann; Emmaline Augusta Begemann; Dorothy Lorraine Fiegenbaum; Irene Henrietta Wilhelmina Begemann, holding Edward John Begemann; Edna Anna Clara Begemann; Henry Martin Fiegenbaum; August Wilhelm Begemann; J. W. Fiegenbaum. The youngest child in the photo is Edward J. Begemann, born in September 1934. He appears to be about the right age for this photo to have been taken in the Spring of 1935 (it doesn't look as if the tree in the background has any leaves yet). This photo was probably taken on the farm that was home to the Wilhelm Friedrich and Henriette (Starkebaum) Fiegenbaum family and later the Edwin Friederich and Lucille (Rinne) Fiegenbaum family, south of Mayview, Missouri. And if I remember right, it was taken at our house back in the field close to an apple orchard. It must have been Easter time. We are all dressed up (except the boys) and reason I know we were "dressed up" in our Sunday best, is that I have that trademark of a bow stuck in my hair, and mom put that in whenever I had to be "dressed up" which meant going anywhere off the farm, be it to town, church, or visiting. By January 1940, when all was said and done, Grandma Fiegenbaum would end up with 15 grandchildren. But what I want to know is, where did they get a single, long plank that would support all those kids for this picture!